Hi everyone. I'm new to the forum and I found a little apple tree under another apple tree. 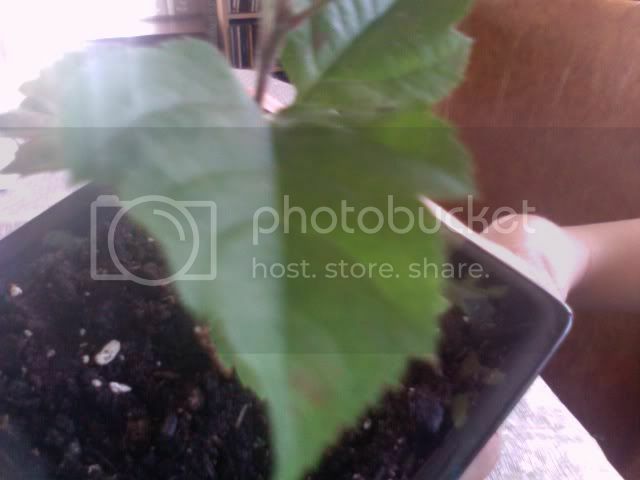 I was just wondering if apple trees made good bonsai trees. I think it's a pretty tree and I'd like to know if anyone can identify it and give me some tips so I don't kill it. haha. thanks. Also, I'm using regular miracle grow potting soil, and there is no place around where I can get actual bonsai soil but I did see cactus soil some place. Would that be a good substitute and would it be good to mix with the potting soil to make a good mix? Thanks. Hello and welcome to the forum. 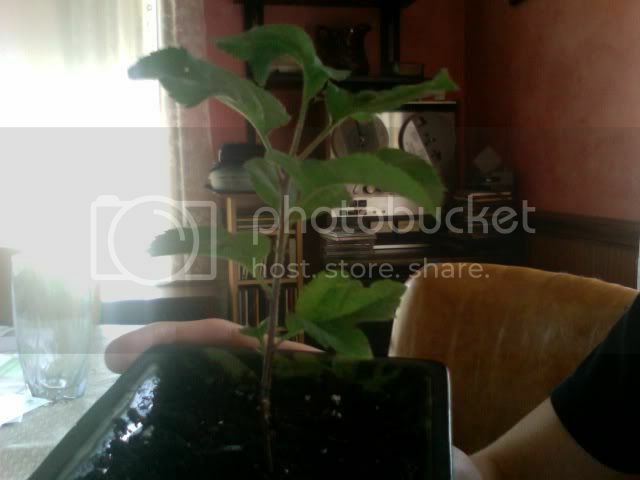 Yes Apple trees can be used for bonsai. I won't say that a full sized Apple can't be used but it is far more common to see Crab Apples used. They are more in scale, especially the fruit if you expect to have any in the future. More importantly, you have made one of the most common mistakes newcomers to bonsai do, you have placed a seedling in a bonsai pot. Bonsai are not developed in such small pots. Bonsai pots are reserved for trees that have already reached a greater stage of development. In a small pot like that you will never get the growth that is necessary in order to pull off the illusion of age. Bonsai, even small ones, are often cut down from larger trees. Sometimes they are developed from seedlings but even then there is series of growth and pruning cycles that occur. What should I do since I already have the tree in the pot? Despite what I wrote earlier the size of the pot is not an issue this year. As bad as it is to have a developing plant in an unnecessarily small container, an overly large one presents a different set of problems. The best scenario for growing trees out in pots is to pot them up in a timely manner. When the pot is colonized with roots it is time to move up. 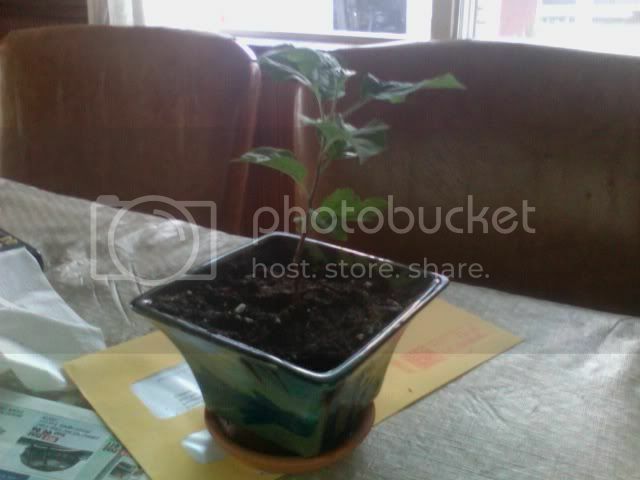 Next spring re-pot it just before bud break into an appropriately sized container. 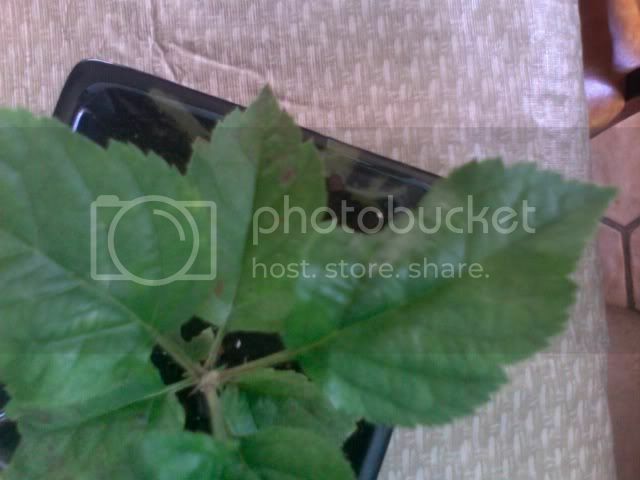 It need not be a bonsai pot, a discarded nursery container is fine. Depending upon how well the plant grows for the balance of this season you may be able to do some initial root work. At that time I would take the opportunity to use a better soil mix. You have all winter now to do your research and either purchase a soil mix or gather the components to mix your own. Have a look at the sticky threads located at the top of the forum. There is one on general tips that has some information on watering practices. There are also two others that pertain to soils and re-potting. Make sure to follow the links as well. Oh, and just to make sure; you are not keeping it inside are you? i have been keeping it outside. I'm guessing it's not meant for indoor s by how you said that haha. New Juniper grower needs advice HELP! !